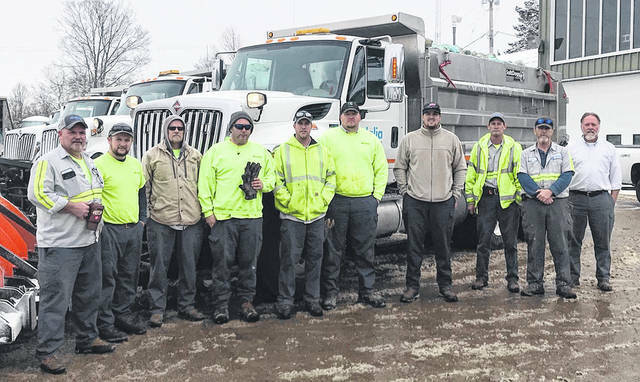 The Vandalia City Manager’s office offered thanks to employees in the city’s Public Works department that have worked countless hours over the past month plowing snow, salting roadays, and repairing water mains. Pictured left to right are Bill Miles, Jake Hayslett, Don Whitaker, Jamey Stevenson, John Bubeck, Scott Gibbs, Jordan Feeser, Mike Busse, Dennis Edwards, Steve Nickels. Not pictured are Joe Blosser, Mark Blosser, DeWayne Hopping, Zeb Ward, Randy Ellish, Josh Woss, and Rick Wegley.